The fiscal years of Greece after 1974 were all marked by budget deficiency, and this led the country to borrow money from foreign investors to be able to pay pensions and military wages. Up to 2002, when things would get rough, a useful tool of being able to borrow more money was the devaluation of the Greek currency, the drachma. However, after Greece entered the Eurozone, the devaluation tool was no longer available and the government started borrowing excessive amounts of money, causing the country’s debt to skyrocket. 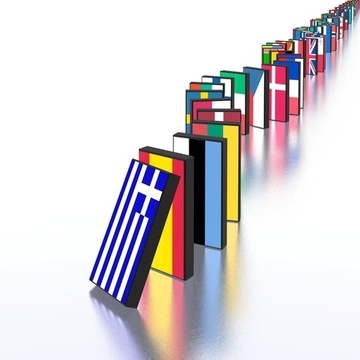 Coupled with the Great Recession of 2008, this caused substantial fear concerning Greece’s ability to pay back those loans and investors started panicking. There were two options available: the one was the country would default, meaning it would immediately stop paying back its loans and the investors would lose their money. This could become a precedent within the Eurozone, as most other European countries also had very high debts, including ones with particularly high GDPs. A default of those countries would then be the final blow in an already fragile and sick world economy. The other way, which was chosen, was that the country should reform its structures, take particularly harsh austerity measures, lay off civil servants and cut back on spending in any way possible. Although this initially eased the fear of investors, it has now caused a humanitarian crisis in the country because of its particularly harsh and multiple measures.